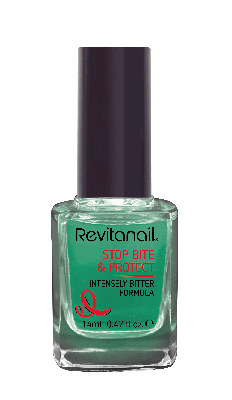 Revitanail Stop Bite & Protect is enriched with cermium red algae, which works to retain water in the nail cells. It is formulated with cactus extract to moisturise, condition and protect nails. This unpleasant-tasting formula will be sure to prevent putting hand to mouth and allows nails to recover and repair. Holy grail for nail biters of any kind!! Whether you nibble your nails, chew the sides or are a severe nail biter since you can remember, this product will do the job without a fail 100%. It taste like 1000 different chemicals and poisons mixed together, you're probably thinking that is a bad thing but that is exactly what you want in a product meant for preventing nail biting. My partner uses this and he hardly has any nails left due to severe nail biting and this has worked a miracle. It is affordable, effective and just overall a heaven sent. I have told many people about this product and it has proven to be very effective. The best part is you should only need to dip it in once for each hand, it spreads a long way and you definitely don't need to lather it on. I recommend applying once a week, at the end of the week use nail polish remover to remove it and then reapply. This is because the nail polish itself is clear so you aren't aware of when it wares off. So for full effectiveness and to ensure you always have it on, take it off and reapply fully. This stuff is REVOLTING. Literally the most disgusting thing I have ever tasted, which makes it incredibly effective at stopping you from biting your nails! Even if you only paint the smallest part of your nail, the taste of this stuff lingers for days. If you even put your fingers near your mouth you'll be hit with the foul taste. The only downside is that the taste of it gets on anything you touch, so if you're having any finger type foods such as chips/popcorn etc, the taste of these will be ruined. This is kind of a good thing as it really adds to the unpleasantness of biting your nails, but it can really ruin a trip to the movies. This stuff works so well, it really helps to stop you from wanting to put your nails anywhere near your mouth. I have been a chronic nail biter my entire life. I have tried painting my nails to refrain myself from biting them, but I still end up chewing through the polish. This product however, tastes DISGUSTING! But that is the point! Somehow my brain becomes trained to bite my nails less and less because every time I try to, I get the foul taste in my mouth and immediately regret it. I love that the ingredients in the polish not only help me overcome my nail biting addiction, but are working to repair and nourish my nails. Are you guilty of these bad habits too? Because we all fall off the health wagon occasionally. Forgive us, for we have sinned. Myer, David Jones, Priceline, Priceline pharmacies and leading pharmacies nationally.